Recently I replaced my primary tele zoom with a shiny newer version. It must seem a bit strange, to replaced it so quickly after my glowing review of the 80-200 af-s. Basically, it came down to this. The repairs mentioned in the review didn’t solve all my problems. I continued to experience unsharpness problems, even though the fine technicians put it through every test they could think of. Perhaps it was just a perception problem. Or maybe it was experiencing front- or back-focus issues. Who knows. Then I noticed a local shop had a great second hand AF-S 70-200 version 1 on offer. A great price, in pristine condition, and affordable, considering I would be trading in my refurbished 80-200. I got a good deal for that, as it is now one of the few 80-200’s out there, which does not have auto-focus issues. The 70-200 looks a lot sharper to me. The focus is faster. And it has Vibration Reduction. The last is a feature I never considered useful to me (if you use slow shutters speeds, just use a tripod). Shooting video changed my mind. Long lenses have the tendency to vibrate more when attached to a camera. This is not an issue when taking photographs, but you can see everything when shooting video. The tiniest of shakes, the wind hitting the lens, everything is visible. Not so with VR switched on! The lens is also a lot lighter and smaller. It’s truly a great upgrade, and I’m completely in love with the image quality. I would recommend it over the newer VRII version, because of the price difference. But very few people reading this will probably buy this lens. 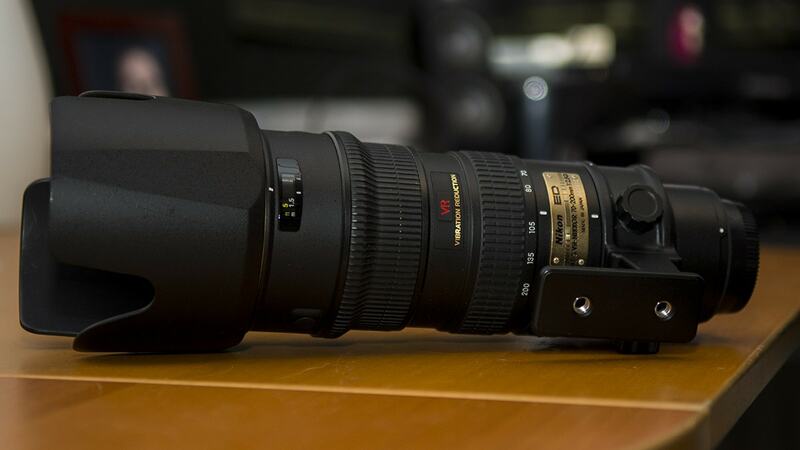 It’s a specialist device, great for bokeh nerds and journalists. If you want to invest in a 70-200, I would really suggest the F4 model, which is a lot more portable, and does 80% of what this lens does.